I was sweeping the shop when a glimmer between two floorboards caught my eye. A penny? I knelt for a closer look. "Lucinda Chapdelaine was orphaned as a young child when her parents left for a royal ball and never returned. Ever since, she has toiled away in her uncle's lonely jewelry shop under the cruel hand of her step-aunt. But now, all at once, Lucinda's lot is about to change. A mysterious woman, a handsome young gentleman, and an unusual gem all enter the shop on the very same day. The woman is none other than the dreaded Amaranth Witch, and she has a daring task to offer. If Lucinda succeeds, she will not only reclaim all that is rightfully hers, but she will a discover a true friend...and perhaps a true love. Family secret, magical surprises, and another royal ball will test her, but Lucinda is determined to find her own happily ever after." 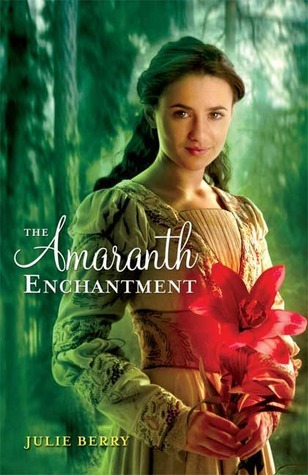 The Amaranth Enchantment is an unremarkable but fun and entertaining fairy tale. I picked it up at my school library, and it's worth a read if you're a fan of fairy tale-esque stories, which I am. It was very reminiscent at least in some respects of other middle grade fairy tale/fantasy novels such as The Runaway Princess and one other one I've read but whose name I'm blanking on. In this case, the beginning of the book was much better than the ending. At first, the novel felt really atmospheric, and I was thoroughly enjoying it. The Amaranth Enchantment is set in the real world, historically, except that it also has magic, and there are other worlds that can be reached through wells (that was kind of weird). I feel like the adding of countless other worlds just made the book way more complex, and it wasn't fleshed out properly. I did enjoy the main character though, and some of the secondary characters too. The plot itself isn't that interesting, but follows the same mold as many fairy tale retellings; it's vaguely like Cinderella. Lucinda is from a wealthy family and she's taken in by her cruel aunt who abuses her horribly. Then she meets a prince, completes a quest...you get the idea. All very well and good, but nothing special. I found the book entertaining, breezy, and quick, and I did like it; it just wasn't structured very well. There was never really a climax, and what could have passed for a climax was just quick and rushed. Overall if you were to draw out the book's progression it would just be a bunch of small waves, rather confusing actually. The book's not action-packed, that's for sure. Beryl or the amaranth witch was a really odd character, at least to me. She kind of randomly appeared, and so did the prince for that matter, coincidentally showing up at the shop on the same day and turning Lucinda's life upside down. This stretched belief just a little bit; "Beryl" as a name also wasn't very good. It was hardly fitting for someone from a different world with intense magical powers. Overall the book was very predictable except for one twist at the end that I was totally not expecting. It was good as a fantasy novel, but the world didn't particularly interest me, nor would I ever see myself rereading this book or reading a sequel. I would skip it, although there's nothing particularly bad about The Amaranth Enchantment; it just had some issues in terms of plotting and wasn't very suspenseful or memorable. In other words, it was rather bland.